The Asian Institute of Technology (AIT) was blessed with auspicious royal patronage when Her Royal Highness Princess Maha Chakri Sirindhorn formally inaugurated the modernized AIT library, the AIT Clock Tower, and the new AIT Gate on 27 April 2018. 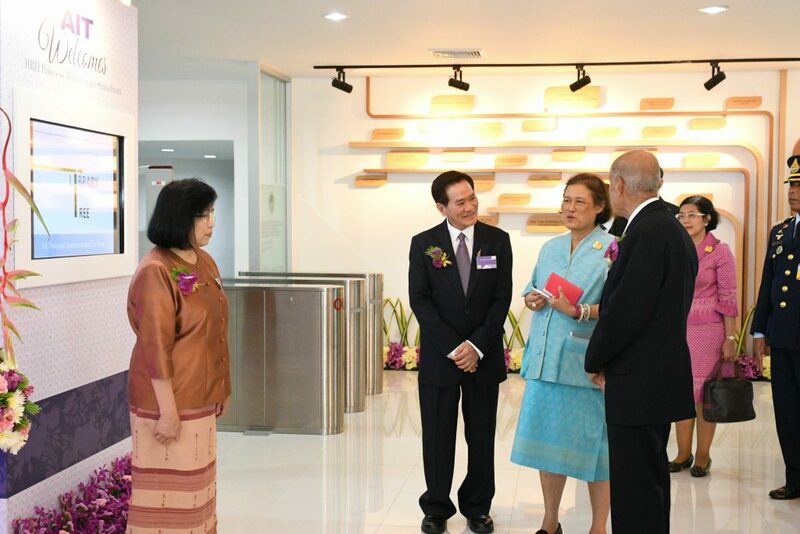 HRH Princess Maha Chakri Sirindhorn inaugurates the Modernized AIT Library. Accompanied by President Prof. Worsak Kanok-Nukulchai, and Chairperson of AIT Board of Trustees, Dr. Subin Pinkayan, Princess Sirindhorn is greeted by AIT Librarian, Ms. Pranee Kiriyanant (extreme left). At a stellar function organized in the precincts of the AIT Library, Princess Sirindhorn inaugurated the new facilities, and by the press of a button digitally unveiled two new landmarks in realtime — the Clock Tower and the new Gate. The opening event was a showcase of AIT technologies where tradition merged with modernity, and the ceremonial unveiling of the curtain was activated by sensor-based technologies — all of which was streamed live for the participating audience. The inauguration of the modernized library is an important milestone for AIT, since the entire ground floor facilities had been inundated by the ravaging flood of 2011. The movement to create a new library received royal patronage in January 2015, when Princess Sirindhorn blessed the campaign and provided seed money of 1 Million THB to launch the campaign. A brainchild of AIT President Prof. Worsak Kanok-Nukulchai, the Library Fundraising campaign ultimately emerged as the most successful fundraising event in AIT history, collecting nearly 80 million Thai Baht. The day marked the grand finale when the Princess also honored major donors in the fundraising campaign, awarding certificates to individuals and corporates that had donated over 1 million THB each. All donors have also been recognized at various facilities in the AIT library which includes a glass panel display, a tree of major donors, and naming of facilities in their honor. Dr. Subin Pinkayan, Chairperson of AIT Board of Trustees, expressed his gratitude at the august presence and patronage of the Princess. He stated that as an alumni, it has been a great honor and privilege to serve as Chairman of this prestigious institution. Narrating the challenges posed by the flood in 2011 which was the worst natural calamity in AIT’s history, as well as the deadlock in the administration and a void in governance due to legal challenges, Dr. Subin mentioned how the continued use of the AIT Charter of 1967 (2510) and the accompanying AIT Enabling Act has provided the legal recourse to normalize AIT’s relations with host country Thailand. Speaking about the AIT renaissance, the Board Chairman commended the leadership of the AIT President Professor Worsak Kanok-Nukulchai for having successfully and in a very systematic manner addressed the issues one by one, and for effectively implementing the strategies and directions outlined by the Board. Chairperson of AIT Executive Committee, Dr. Sahas Bunditkul and President Prof. Worsak Kanok-Nukulchai with HRH Princess Maha Chakri Sirindhorn. In his report to Her Royal Highness, Prof Worsak traced the challenges faced by AIT and these challenges and critical episodes provided AIT with an opportunity to reset itself for a new life. “My immediate task after taking my office was to regain the trust of our host country. With the support of Your Royal Highness, AIT has succeeded in restoring the trust and the support from the Royal Thai Government, “ Prof. Worsak said. He mentioned how the critical issue of relations with the host country was resolved, and how the pressing issue of regaining public confidence in AIT's academic standing was tackled with the institute making a mark in global university rankings. “The daunting task of my presidency was to renovate our campus which was damaged to a point where many thought that it could not be rescued after all,” the AIT President said, as he highlighted the measures taken to overcome the financial and administrative crisis in AIT. Elaborating on the success of the AIT Library Modernization campaign, Prof. Worsak mentioned that AIT was “able to galvanize the faithful participation of AITians, friends, and partners in presenting this wonderful gift to our beloved institute.” President Worsak expressed his heartfelt gratitude to Princess Sirindhorn for guiding the Institute through this period, and for serving as the Honorary Chair of International Advisory Committee of the AIT Library Modernization. Princess Sirindhorn was greeted by a bevy of international students dressed in their traditional attire, and she was welcome at the AIT Library by the Library Director, Ms. Pranee Kiriyanant who presented the new library facilities, and the exhibition prepared in honor of the Princess. A special exhibition displaying the association of HRH Princess Sirindhorn with the Asian Institute of Technology was the highlight of the event. 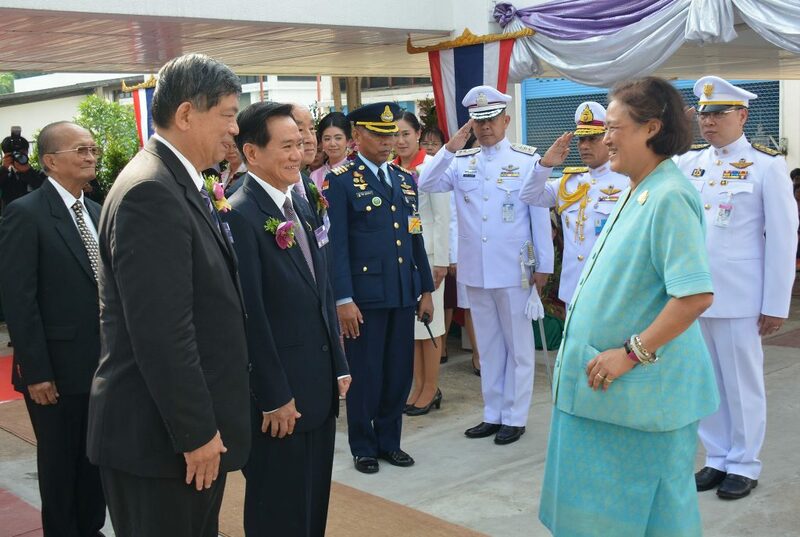 Princess Sirindhorn is a Royal alumna of AIT having studied at the Asian Regional Remote Sensing Training Center (ARRSTC) in 1984. In 2010, she became the first ever inductee into the AIT Hall of Fame. Her research work, a collection of photographs, and memorabilia are also highlighted at the AIT exhibition. A highlight of her visit was the exceptional interest evinced by Her Royal Highness during her visit to the new library facilities. Viewing the exhibition of her student days at AIT, Princess Sirindhorn interacted with Dr. Subin and Prof. Worsak. She also took notes while examining the research exhibits. The modernized Library also had two AIT faculty members — Prof. Weerakorn Ongsakul demonstrate the solar panel installation, and Prof. Manukid Parnichkun present the Library Robot. Also opened to the public were the new renovated administration building, which provides for exhibition space, visitors gallery, and display of other AIT exhibits. An exhibition of AIT innovations by AIT Solutions was on display at the AIT administration building. Additional new campus renovations include a prominent AIT bus-stop, and a new annexe at the AIT Conference Center which has been built using SCG-Heim prefabricated housing technology. Another major upgrade is infrastructure backbone and campus landscaping, with the Library surroundings now including a knowledge garden and a well-lit elegant patio. A video titled “AIT rises again,” which shows the journey from the flooded campus to a modernized has achieved was played at the AIT Conference Center for the visiting delegates. The event witnessed participation of people from all over, with nearly two dozen dignitaries flying from various parts of the world to participate in the event. The founder director of the AIT Library Dr. Hwa-Wei Lee, who has also served as Honorary Adviser to the AIT Library Modernization campaign was among those participating in the event.